This User LICENSE AGREEMENT between the Licensee identified below and UNESCO-Encyclopedia of Life Support Systems (EOLSS) (the Licensor) grants to the Licensee and Authorized Users (defined below) at the Licensee's institution the right to access EOLSS-Online, the Online UNESCO-Encyclopedia of Life Support Systems, subject to the terms and conditions of use set forth in this License Agreement. Institutional Users such as corporations, libraries, institutions, universities, colleges, secondary schools, government, and consortia (such as universities and libraries) may register online or alternatively print a copy of this INSTITUTIONAL USER LICENSE AGREEMENT, then complete, sign, and return to UNESCO-Encyclopedia of Life Support Systems (EOLSS) by fax. The Registered Contact will receive an e-mail reply with access information from the Licensor within 72 hours after receipt of the signed License Agreement. If you do not receive notification within 14 days following registration, please contact the Licensor. Contact person responsible for administration of License Agreement. a) EOLSS-Online: refers to online product of the UNESCO-Encyclopedia of Life Support Systems available from the Licensor or their affiliates on the Worldwide Web and all Web pages contained therein as updated or revised from time to time while this license is in effect. b) Licensed Materials: The materials subject to this License Agreement. These consist of those contributions which have been installed on the EOLSS-Online website for online access by the Licensee in accordance with the Terms and Conditions of Use as given herein. 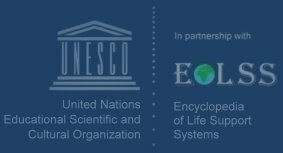 c) Licensor: UNESCO-Encyclopedia of Life Support Systems (EOLSS). d) Licensee: The customer named in the registration, who has authorized acceptance of this License Agreement and completed the registration. The Licensee provides access via their Secure Network to the Licensed Materials for their Authorized Users and is responsible for implementation of this License Agreement during the trial period. e) Secure Network: Secure Network shall mean a network (whether stand alone network or a virtual network within the Internet) which is only accessible to Authorized Users. A cache or proxy server or any server or network which can be accessed by unauthorized users is NOT a Secure Network for these purposes. f) Authorized Users: Authorized Users means only the employees, faculty, staff, students officially affiliated with the Licensee, and persons with legal access to the on-site facilities. Individual members of the public registered as users and those permitted to use the Licensee's library or information services; in each case who are permitted general access to the Secure Network by the Licensee. g) Number of Users: The License Agreement is based on the number of users who will have access to the Licensed Materials. a) The Licensor grants to the Licensee and their Authorized Users, during the Term as defined below, a non-exclusive, non-transferable License Agreement to access the Licensed Materials according to the terms and conditions described herein. b) The Rights of the Licensee do not extend to their subsidiary or parent organizations, or to any other related or affiliated organizations. The Licensee may not assign, sub-license, transfer, charge or otherwise dispose of their rights under this License Agreement without the prior consent of the Licensor. c) The Licensee and their Authorized Users acknowledge that the copyright and title to the License Agreement Materials and trademarks or services marks relating hereto remain with Licensor and/or their Designated Online Provider(s). Neither the Licensee nor their Authorized Users shall have right, title or interest in the License Agreement Materials except for the limited rights as expressly set forth in this License Agreement. All rights not specifically granted to the Licensee are expressly reserved for the licensor. d) Access to the Licensed Materials shall be via the Internet Protocol (IP) address(es) of the site or Remote Patron Authentication (RPA). The Licensee is responsible for providing the valid IP address(es) for the Licensee's Secure Network at the Licensee's premises. If your organization has more than one IP address or a range these must be specified during registration. Valid IP addresses may NOT include proxy or cache servers that are accessible to the general public. Licensees must notify the Licensor of any changes in IP addresses. a) Authorized Users may download, view, copy and save to hard disk or diskette and store or print single copies of individual chapters for the Authorized Users' personal use, scholarly, educational or scientific research, and the Licensee's internal business use provided they keep intact all copyright and other proprietary notices. b) Authorized Users may download and print multiple copies of material from the Licensed Materials for the purpose of making a multi-source collection of information for classroom use (course-pack). c) Authorized Users have the right to reproduce, with appropriate credit, figures, tables and brief excerpts, not to exceed 20% of any single chapter and in no case more than 4000 words, from individual chapters in the Licensed Materials in the Authorized User's scientific, scholarly and educational works. In the event of any permitted use of copyrighted material, no changes in or deletion of author attribution or copyright notice shall be made without written authorization from the Licensor or other copyright owner. d) Authorized Users may not restrict or inhibit any other Authorized User's access to or use of EOLSS-Online. e) Authorized Users may not modify, adapt, transform, translate, recompile or create any derivative work based on any materials included in the License Agreement Materials, or otherwise use any such materials in a manner that would infringe the copyright therein. Any copyright notices, other notices or disclaimers included by the Licensor in the License Agreement Materials or any accompanying screen displays may not be removed, obscured or modified in any way. f) Other than as specifically permitted in this License Agreement, the Licensee may not use the License Agreement Materials for commercial purposes, including but not limited to the sale of License Agreement Materials or bulk reproduction or distribution of the License Agreement Materials in any form, or disseminate through electronic means including mail lists or electronic bulletin boards. a) The Term of this License Agreement shall commence on the date this License Agreement is activated by the Licensor and continue for the trial period. b) The Licensor shall have the right to request the Licensee to terminate access to the Licensed Materials by an Authorized User who breaches the Terms and Conditions of Use or infringes copyright in the Licensed Material. c) The Licensor may terminate this License Agreement early if the Licensee materially breaches their obligation under this License Agreement and fails to cure such material breach, provided that the Licensor shall give written notice of their intention to terminate and shall allow the Licensee 30 days after receipt of such notice to remedy the breach. d) The Licensor reserves the right to revise or update the Licensed Material as and when deemed appropriate. a) Make reasonable efforts to ensure uninterrupted online access to and continuous availability of the Licensed Materials to the Licensee. b) Make access available to Authorized Users from the designated IP address(es) at the Site through the Licensee's Secure Network, undertake reasonable measures within their control to prevent access to and improper use of the Licensed Materials by unauthorized persons and take responsibility for terminating any unauthorized access of which it has actual notice or knowledge. c) Take all reasonable measures to inform Authorized Users of the Terms and Conditions of Use and emphasize to such Authorized Users the need to comply with whatever restrictions on access, use, reproduction, and transmission as included therein. d) Promptly notify the Licensor of any copyright infringement or unauthorized usage of the Licensed Materials which comes to the Licensee's attention, and cooperate with the Licensor in the investigation of such infringement or unauthorized use and in any action which the Licensor takes to enforce their copyright, at the Licensor's expense. e) Provide the Licensor with information about the Licensee's IP address(es) as updated from time to time, which can be used by the Licensor to authenticate Authorized Users. In the event any dispute or controversy arising out of or relating to this License Agreement, the parties agree to exercise their best efforts to amicably resolve the dispute as soon as possible. a) The Licensor may assign this License Agreement to their successors, subsidiaries and assigns. b) The Licensee may not assign or transfer their rights or obligations under this License Agreement except with the prior written consent of the Licensor, which consent shall not be unreasonably withheld or delayed. c) This License Agreement shall be construed and interpreted pursuant to the International Law, the laws of other countries(parties to international copyright treaties) and United Nations Convention on Contracts. Any legal action, suit or proceeding arising out of or relating to this License Agreement or the breach thereof shall be instituted in a court of competent jurisdiction under the International Law, the laws of other countries, and United Nations Convention on Contracts and each party hereby consents and submits to the personal jurisdiction of such court, waives any objection to venue in such court and consents to the service of process by registered or certified mail, return receipt requested, at the last known address of such party. d) In the event of a material breach of the terms and conditions of this License Agreement by either party, the non-breaching party shall be entitled, in addition to any other remedies available pursuant to this License Agreement or at law, to equitable, including injunctive, relief. This License Agreement constitutes the complete understanding of the parties and supersedes all prior oral and written understandings between the parties with respect to the subject matter of this License Agreement. Neither party shall be liable in damages or have the right to terminate this Agreement for any delay or default in performing hereunder if such delay or default is caused by conditions beyond their control including, but not limited to Acts of God, Government restrictions (including the denial or cancellation of any export or other necessary license), wars, insurrections and/or any other cause beyond the reasonable control of the party whose performance is effected. a) The Licensor shall have the right to change or discontinue any aspect or feature of the Licensed Materials, including but not limited to content, functionality, hours of availability, and equipment needed for access or use. Such changes, modifications, or additions shall be effective immediately upon notice thereof, which may be given by means including but not limited to posting on the Website, electronic or conventional mail, or any other by which you obtain actual knowledge. b) The Licensor reserves the right to modify the terms of this License Agreement immediately by providing notice online to Licensees by electronic or conventional mail. Any use of Licensed Materials by the Licensee after such notice shall be deemed to constitute acceptance by the Licensee of such changes, modifications, or additions. If any provision or provisions of this License Agreement shall be held to be invalid, illegal, and unenforceable or in conflict with the law of any jurisdiction, the validity, legality and enforceability of the remaining provisions shall not in any way be affected or impaired thereby.